It is a treatment used to kill cancer cells by applying precise high-energy radiation. Radiation is invisible and is not felt at all, but it damages your cells. It damages cancer cells as well as normal cells. Normal cells have a better capacity to repair damage than cancer cells. Radiotherapy uses that difference for treatment. In standard radiotherapy utilizing this phenomenon, a radiation dose is divided into 30 portions, and is applied little by little to a broad area including normal cells and cancer cells. However, if it were possible to irradiate cancer cells alone without irradiating any normal cells, treatment could be performed without dividing the dose and without causing adverse reactions. Practically, it is impossible to completely avoid irradiation of normal cells during treatment. A safer and more effective treatment is possible with fewer irradiations in a shorter period if irradiation is concentrated on cancer cells as much as possible. 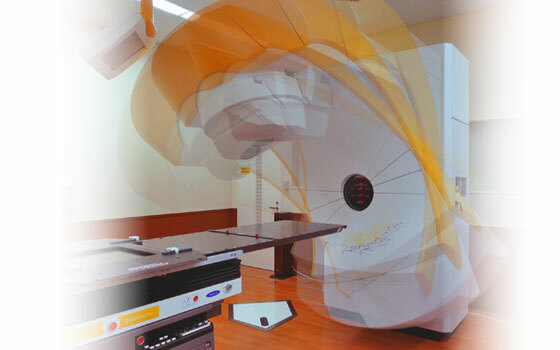 Our clinic uses a state-of-the-art Novalis linear accelerator system (radiotherapy device) for high precision radiotherapy. A 3 mm Micro Multi Leaf Collimator (mMLC)(*1) is attached to the accessory mount of the linear accelerator in order to fit the shape of the radiation beam to the tumor so that irradiation to surrounding normal cells can be reduced. We control the mMLC very precisely to carry out high-precision radiotherapy such as stereotactic radiotherapy (SRT, SRS) and intensity-modulated radiation therapy (IMRT)(*2). However, even with a high-precision device, accurate treatment cannot be performed if patient positioning is not correct. Our clinic performs image-guided radiation therapy (IGRT)(*3) with automatic positioning of the patient (tumor) using X-ray imaging and infrared monitor cameras. The radiation beam is narrowed down to just cover the shape of the lesion (cancer) for radiotherapy. The device used to narrow down the radiation beam is called a collimator. The collimator installed on the radiotherapy device at our clinic narrows down the radiation beam using 3mm thick metal blocks. The shape of the irradiation target, which is formed by combining these metal blocks, is precisely controlled by a computer, which allows matching the radiation shape more precisely with the lesion. This allows minimizing the irradiation of normal tissue that surrounds the lesion. This collimator is called a micro multi leaf collimator. The radiation beam is narrowed down to just cover the shape of the lesion (cancer) for radiotherapy. This way, radiation is focused on a specific area, and irradiation of healthy tissues can be prevented. However, if a normal organ susceptible to radiation is near the target lesion, the organ may also be irradiated, which results in side effects. IMRT is a method used to form the radiation beam into the shape of the lesion, and furthermore to change the strength of the beam. This way, strong radiation is exclusively applied to the cancer, while exposure to the surrounding normal organs is minimized. IMRT allows aggressive treatment of cancer in locations that have not previously been considered as targets for radiotherapy. In conventional radiotherapy, positioning marks are drawn on the surface of the skin around the treatment target. This is radiotherapy that relies solely on the marks on the skin’s surface. It is impossible to confirm in situ status and patient positioning during the treatment. IGRT is radiotherapy that uses imaging devices such as X-rays and CT scans (diagnostic imaging) to observe in situ status and patient positioning during treatment.